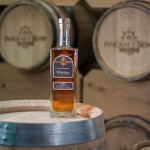 Pinckney Bend Rested American Whiskey was awarded a Double Gold Medal at the prestigious San Francisco World Spirits Competition. The March 2014 event included more than 1400 entrants from 67 countries. Winners were announced in April of this year. San Francisco gives artisan distillers a chance to compete against some of the biggest names in the spirits business.